Though there are a great many articles on the subject of Operation Gladio and the Strategy of Tension, I've yet to see a single qualified definition of this strategy. Quite correctly, commentators identify the actions of the covert army in Italy as being this strategy put into practice, but there's very little discussion of the specific way this strategy is supposed to work. So, explicitly, it is this: to create tension as a means firstly to fragment or otherwise undermine movements opposed to one's own desires, and secondly to accelerate the movement one desires. It's two strategies for the price of one, operating at the same time through the same actions. Specifically, with regard to Italy in the latter half of the 20th century, the aim was to use the fear to instill in the public an association between communism and arbitrary violence, as well as to create or exacerbate divisions within the communist groups, whether political or paramilitary. This also applied internationally due to mass media coverage of the various bombings. It is my contention that essentially the same strategy can be seen at play across much wider and more personal realms than that of state politics. Across an increasing number of nations and cultures we can see this dynamic of fear as both a means to paralyse and mobilise play out as a way to sell people things and as a means of social control. As noted by Edward Bernays, this can take the form of a liberating education or technology which is ultimately used to further the interests of an elite. Bernays, a nephew of Sigmund Freud, would go on to help the CIA with the coup that toppled Arbenz in Guatemala in 1954, as covered in Adam Curtis' documentary The Century of the Self. In providing this help, in particular the suggestion that irrational and unjustified fear of Arbenz as a Moscow-controlled Communist revolutionary, Bernays became the very embodiment of his own theories. It is this last line in particular that is significant; the idea that without propaganda we can have no mutual cooperation or peaceful interaction, that without an elite guiding us through manipulation and deception we wouldn't be able to have a 'democratic' society. Aside from the rather obvious problem that any society controlled by a manipulative elite is anything but democratic, this is an accurate analysis of how the general population is viewed by that elite. They think we need them, that we couldn't survive without them, or rather, they need us to believe that we couldn't survive without them. The primary mode through which this creation in us of a sense of need of them is accomplished is what I refer by 'A wider strategy of tension'. We're consistently taught from a young age that our self-worth depends on our being appreciated in specified, sanitised ways by others around us, yet the way in which we're taught this is tense, dragging people in two ways at once, as though they are the flag in the middle of a tug o war. Zbigniew Brzezinski discussed some of these paradoxes of globalised power in his 1970 book Between Two Ages, America's Role in the Technetronic Era. While Zbigniew is obviously talking geopolitics, the same is true of personal and social identity, that tension encourages division, more hostile opposition between groups, tastes, ethics. The more divided a people are, ironically the easier it is to unite them in action. This is because the division results from a broad and shared sense of lacking, the result being that lots of different people subscribe to the same thing having been convinced they're doing it for different reasons to everyone else. Dozens of TV shows, articles, movies, editorials and the like talk of 'identity crisis', and invariably the solution is conformity to a widely held standard, typically through the purchase and use of some product. This is concisely illustrated by the fact there's even a clothing label of that name. However, the purchasing and using of that product will invariably be portrayed as individualistic and liberating, rather than conformist and controlling. This wider strategy of tension is designed to perpetuate itself, as the tension is maintained through to the very conclusion. Ultimately, this helps keep people going round in the same circles. Celebrity endorsement is a must in contemporary cosmetics adverts, at least for women, though this is becoming increasingly the case in equivalent adverts for male cosmetics too. By making use of people widely considered to be attractive and successful they are encouraging the association in people's minds that these virtues are in fact contingent on the products being advertised, to the exclusion of all other means of being recognised as attractive and successful. The strapline for this particular L'Oreal ad - ready to make the world shine? - epitomises this thinking, that to stand out and be noticed one has to 'shine', hence one needs these ridiculous crystals. This advert with Beyonce is even worse, in that the product is named 'infallible', even further encouraging people to identify the item as a categorical necessity, and openly shows the singer/model using the product as a means to feeling socially confident. Take the long standing L'Oreal slogan 'because you're worth it' - it is an explicit association between worth (value, virtue) and the product on offer, the tacit implication being if you don't have this product, it is because you aren't worth it. It's worth noting that this slogan was changed around five years ago from 'because I'm worth it' not only because this shows how the propaganda is getting more direct, but also because it shows how 'I' and 'you' are essentially interchangeable in this philosophy of conforming to a particular notion of individualism. In fact, rather than liberating women (and men, increasingly), this industry thrives on the production of feelings of insecurity, inadequacy and competition as a means to controlling behaviour and taking people's money off them. There is nothing independent about feeling that without shaving a certain part of your body or applying some lotion or fragrance that you aren't a free individual/proper member of society. One brutal upshot of this was illustrated in 2007 when L'Oreal were found guilty of racial discrimination, choosing only to employ white women to promote their shampoo in Paris supermarkets. Even Beyonce is only as black as Barack 'the change we need' Obama, i.e. black enough to appeal to black people but white enough to not to put off the liberal racists. Match.com, a dating website, ran an apparently successful advertising campaign in autumn 2008 which is reminiscent of the strategy used by the UK government when it comes to terrorism statistics. Initially they ran an ad looking for 'hot new men', saying that they had a surplus of women on the site. A contemporary citizen cannot even sit with a loved one and watch evening TV without being bombarded with adverts telling you there are 'hot new' possibilities out there, interfering with what is presumably many people's most secure and pleasurable relationship. Likewise, on commercial TV channels one can barely watch for more than an hour without a lifestyle programme of some kind seeking to sell you values and products even between the adverts. Cosmetic surgery will change your life, makeover shows prove you can look better, DIY the crap out of your house to avoid the credit crunch, buy a holiday to avoid the fact you don't like your life at home - these are the lessons of an average evening's television. Without them, no one would seek to buy a new kitchen every year, or a new hair colour every month, and people might actually spend some time making constructive decisions with their lives. The ironic use of 'at home' (in French 'chez-moi' or literally 'with myself') is typical of Derrida, and is wholly deliberate in its ambiguity, as he is referring to both the home and the act of being with oneself. What emerges from this is that you don't even need a camera inside someone's home in order to make them obedient, just a TV screen or some other means of telling them what's expected of them. The expectation, if held widely enough and strongly enough, is sufficient to control them. R D Laing, a Scottish psychiatrist and author, wrote a wonderful book called Knots which sought to record the logic of insecurity that results from these broad social mechanisms, intruded upon and vigilantly maintained by mass media. therefore no one loves me. therefore you are bad. So I do not love you. therefore you are good. So I love you. Laing found in his treatment of schizophrenia that many people could be successfully treated but when they were returned to their social settings, particularly their families, their old problems would quickly return. Adam Curtis briefly discusses this in the first episode of his documentary The Trap: Whatever happened to our dreams of freedom? Laing would conclude that people are ultimately selfish by nature. For all his iconoclasm and rejection of psychiatric conventions he would fall to the desire to concoct a narrative of human nature which afflicts so many intellectuals. One suggestion is that this view of humans as homogenously competitive and self-centred is necessary for any aristocratic political system to operate, and that we're just seeing variations on a theme. Another is that humans are by default capable of almost any conceivable behaviour, and that a combination of predispositions, surroundings, opportunity and sheer chance dictates what they actually end up doing. I prefer the latter. Regardless, Laing was right on the money in his descriptions in Knots, particularly of interpersonal relationships. However one description stands out in terms of how it is that psychological propaganda becomes a habitual cultural philosophy. By reinforcing what are essentially tautologous, circular arguments through frequent repetition we are convinced that bunkum is in fact truth, that constant desire is liberation and that mass manufactured items lead to individual self worth. The repetition and circularity (a rhetorical device as old as the hills in terms of religious rituals) makes it seem like fate, like it is the way of the world. Former British PM Tony Blair called globalisation 'irreversible and irresistible'. Indeed, we brand our political-economic system just as we brand the desire for chocolate. Put simply, we could live without either, there's nothing inevitable about eating chocolate or maintaining a system of massive disparities and exploitation. A further bit of folk wisdom that supports this system of driving people against one another to produce control and regimented identity is 'no pain, no gain', the idea that success is predicated on suffering. This is most obvious in the world of cosmetic surgery, where people have their noses broken and chopped up, women are encouraged to go to 'botox parties' where they drink and have a nerve anaesthetic injected into their faces. One of the more disgusting things that people 'choose' to have done to themselves in the name of beauty is liposuction, where the fat is literally flayed off, resulting in considerable blood loss. The BBC, while pretending to simply report on issues like 42% of UK teenagers having considered plastic surgery, actively encourages such feelings and behaviour through shows like Under 18 and Under the Knife, a BBC three show about British teenagers travelling to America to have surgery they can't get here. Towards the end of the show one of the girls is shown in a montage flaunting her new breasts in a variety of clothes and talking about how she feels more like a woman now she's had two sacks of gel inserted into her chest. Clearly the viewer is supposed to go away with the idea that this is a success story and that such surgery is glamorous and fun and fulfilling. The fact that this girl will still be suffering from whatever insecurity led her to focus on her breasts in the first place is entirely ignored by the show's producers. So, the tension continues, as this kind of programming will only encourage more young people, mainly girls, to think that having their breasts cut open and some bags of liquid jammed in will solve their adolescent angst, and no doubt the attention paid to young people by the BBC will further validate their sense that this is a good thing to do. 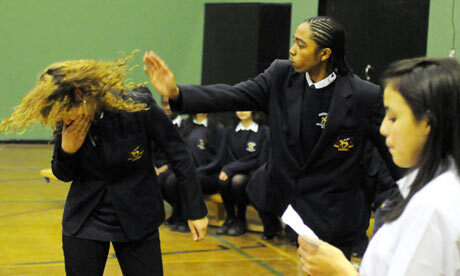 It is a photo taken at a high school performance of a play about domestic violence and in it a young black male (who else?) is seen striking a defenceless female victim. This is the dominant image the left-leaning, liberal progressive Guardian newspaper chose to symbolise their coverage. It isn't even remotely subtle. The result of this one-dimensional coverage is to make women suspicious that all men are brutal thugs, to make men exasperated as being characterised as brutal thugs and to make the whole process of people from two genders getting along more difficult. The hypocrisy of having three ministers 'for women and equality' causes resentment and fear and makes conflict between couples more likely. Of course, they can always go to match.com and find something hot and new.